ALS Research Forum | Pocketful of Posies: Does a Supersized Vesicle Bouquet Promote ALS? Pocketful of Posies: Does a Supersized Vesicle Bouquet Promote ALS? A bouquet of protein strands, capped with presynaptic vesicles, offers up a clue to neurotransmission defects that might occur early in amyotrophic lateral sclerosis. This is the essence of a paper in the July 10 Cell Reports by senior author Patrik Verstreken and colleagues at the VIB Center for the Biology of Disease in Leuven, Belgium. The “flowers” in the bunch undergo acetylation and deacetylation by elongator protein 3 (ELP3) and histone deacetylase 6 (HDAC6), respectively. TDP-43 also takes part in the arrangement because it regulates HDAC6 expression. Variants of both TDP-43 and ELP3 increase a person’s risk of developing ALS. The protein subject to acetyl modification is called Bruchpilot. Fruit flies with Bruchpilot mutations are poor aerialists—hence the name, which is German for “crash pilot” (Wagh et al., 2006). The protein forms long strands that organize into a configuration called a T-bar (see image below). The amino termini cluster together at the synaptic membrane and the carboxyl ends splay out above, where they gather vesicles (Fouquet et al., 2009). Verstreken’s lab previously showed that ELP3 mutant fly neurons poorly acetylate Bruchpilot, causing the formation of widened T-bars that collect extra vesicles and transmit neural signals faster than normal (Miskiewicz et al., 2011). Verstreken suspects that the positively charged lysines in Bruchpilot’s carboxyl terminus repel each other, allowing the stems in the bouquet to spread out and collect more vesicles. Acetylation by ELP3 quenches the positive charge, and the Bruchpilot stems cluster more tightly into smaller T-bars with fewer vesicles. Verstreken has yet to confirm this model. 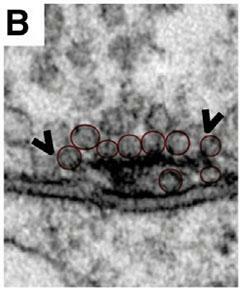 Bruchpilot strands form a T-bar at the presynaptic membrane, where they tether vesicles awaiting release. When HDAC6 is overexpressed, as shown, the T-bars expand and accommodate more vesicles than normal. Cell Reports, Miskiewicz et al., Figure 1. If ELP3 acetylates Bruchpilot, then the cell likely also contains a deacetylase, reasoned first authors Katarzyna Miskiewicz and Liya Jose. A prime suspect was HDAC6, because it functions in the cytosol unlike most deacetylases, it is upregulated by TDP-43, and its expression is altered in ALS-model flies, Verstreken said (Kim et al., 2010; Fiesel et al., 2010). 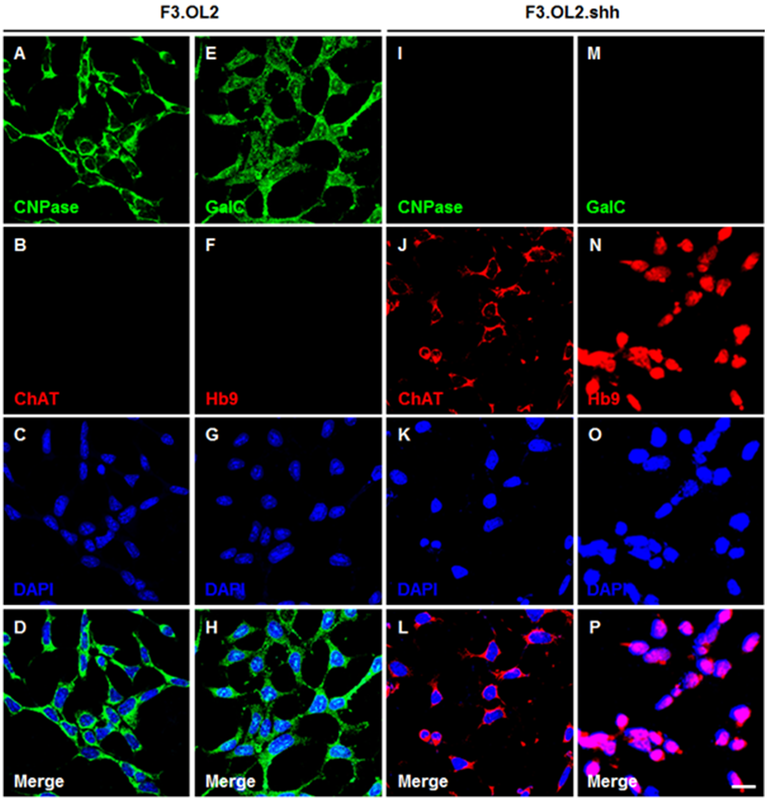 Unlike most deacetylases, HDAC6 acts in the cytosol. The scientists found that it directly deacetylates Bruchpilot in vitro. They also determined that flies overexpressing HDAC6 poorly acetylated Bruchpilot in the brain, whereas flies lacking the enzyme made an abundance of modified Bruchpilot. When the authors examined the fly larvae’s neuromuscular junctions with electron microscopy, they observed that flies without HDAC6 had puny T-bars with but a few vesicles hanging on. In flies with excess HDAC6, the T-bars were broad, with more attached vesicles. Do those extra vesicles change how the synapse functions? Performing electrophysiology on larval neuromuscular junctions, Miskiewicz and colleagues showed that the amplitude of current transmitted was higher in HDAC6 overexpressers and lower in HDAC6-null mutants than in control samples. Because HDAC6 depends on TDP-43 for proper expression, the scientists studied Bruchpilot in flies overexpressing human TDP-43, and in flies lacking the Drosophila homolog of TDP-43, TBPH. As expected, TDP-43 upregulated HDAC6, T-bar size, vesicle recruitment, and neural signaling. TDP-43 mutations associated with ALS led to the largest T-bars. If the problem in TDP-43 mutant flies is under-acetylation of Bruchpilot, then extra ELP3 or less HDAC6 should help, the authors reasoned. Indeed, when they combined TDP-43 mutations with those genotypes, the T-bars and associated synaptic activity returned to normal. In addition, it fixed the movement disability of TDP-43 mutant flies. “Acetylation defects could be a pathologic cascade that leads to synaptic defects early on in ALS,” Verstreken surmised. The excess neurotransmission could lead to excitotoxicity plus the muscle twitches and paralysis typical of the disease, he speculated. However, Verstreken cautioned, “This is only in fruit flies”; with respect to humans, “there is a little problem.” While Bruchpilot is conserved across species, the human version lacks the carboxyl terminus, where the fly protein collects acetyl groups. Verstreken suspects that in people, a different protein tethers synaptic vesicles and undergoes acetylation. He has several suspects in mind, including UNC13A, an ALS gene whose protein manages neurotransmitter release (Diekstra et al., 2012). Verstreken plans to examine T-bars and their acetylation status in human muscle biopsy or autopsy brain-stem tissue. “It is possible that the same pathways are relevant in humans,” agreed Ammar Al-Chalabi of King’s College London in an email to Alzforum. “If so … then a therapeutic approach to consider would be to increase ELP3 expression.” Alternatively, Verstreken suggested, HDAC6 inhibitors might be beneficial. Supporting his idea, researchers recently showed that deleting HDAC6 extended survival in ALS model mice (Taes et al., 2013).